Archives : WEEK OF CONSOLIDATION - 12/06/2009. WEEK OF CONSOLIDATION - 12/06/2009. As mentioned last week, the market witnessed selling pressure on Monday and immediately went down to test the support of Sensex at 14600. However the Nifty managed to go below the support of 4448 on Tuesday but somehow recovered and managed to close atleast 100 points higher than the support. Both Sensex and Nifty have thus formed a bullish reversal pattern called Piercing line, which led to further upside. The market then struggled at the next resistance level of 15579 for 3 consecutive days i.e. Wednesday, Thursday and Friday and finally the market gave in to the selling pressure on Friday. It needs to be seen whether the market takes support, consolidates and once again as usual gives an upward breakout. Next week, the market will be very buoyant and volatile and it needs to be seen whether the market decides for a change to break the support and undergo a correction just before the budget. The rise from the low of 8047 to 15600 is an astonishing 94% without any major correction in between and it would be healthy if the market corrects and goes light into the budget as most of the positive factors seem to have been factored in. IMPORTANT: It has been noted that the Weekly Journal "Informed Investor " has been trying to tarnish my reputation for their own selfish motives. If any one has any grievance with me or my assocites, please feel free to contact me and get it solved. Appropriate action will be taken against those trying to tarnish my image and reputation. The market sold off inspite of two positive set of data coming in, first the inflation and other the IIP number. It was a case of sell on news as the positive surprise was already factored in. The inflation figure came in at a very low of 0.13% v/s 0.48% last week. The fall in inflation continues and for the first time next week we might see a negative inflation number. The IIP number which was expected to come negative came just above 1.2%, thus springing a positive surprise. But even that news was already factored in as the market sold off just after the news. Sensex opened the week at 15153, made a high of 15600, made a low of 14526, and closed at 15237, thus registering a weekly gain of 134 points. On the weekly charts the Sensex has formed a formation very similar to spinning top but the body is very small almost signaling indecision regarding the continuation of the uptrend. On the daily charts the Sensex has formed a Bearish reversal pattern called Two Black crows suggesting short term trend reversal. Last week we had mentioned that the Sensex had gone up for almost 13 weeks in a row and is likely to lose momentum. This week even though it has not formed a Black candle, it has lost momentum, which is very much evident by the long upper shadow in the weekly charts, which shows selling pressure at higher levels. The Sensex is going up in a very peculiar fashion where it moves up first tests the resistance two or three times then comes down, checks the support two or three times and then gives an upward breakout. This has happened four times, the question remains whether we will be lucky fifth time also. The first intermittent bottom for Sensex is at 14526, which if broken will signal a short term reversal and a likely scenario where the Sensex will go down further to test the unfilled gap between 13479-12219. The uptrend can continue only if the Sensex is able to close above 15600, then the Sensex targets will be 16045-16342. The indicators are showing weakness. The momentum indicators like the ROC & RSI are both moving down signaling the market is losing momentum. Trendline support is at 14961-13672. For the week ahead the Resistance is at 15600-15789-16045. Support is at 14961-14526-14002-13611. Nifty opened the week at 4582, made a high of 4693, low of 4365, and closed at 4587. Thus the weekly loss was 3 points. Nifty has formed a Long Legged Doji formation on the weekly charts suggesting uncertainty about the continuation of the prevailing uptrend. The long upper shadow suggests selling pressure at higher levels and long lower shadow suggests buying at lower levels. The Nifty has formed a bearish reversal pattern called Two Black Crows on the daily charts, which indicates short term trend reversal. The Nifty is going up in a very peculiar fashion where it moves up first tests the resistance two or three times then comes down, checks the support two or three times and then gives an upward breakout. This has happened four times, the question remains whether we will be lucky fifth time also. As mentioned last week, after 13 straight weeks of upmove Nifty has finally halted and formed a Doji on the weekly charts raising uncertainty over further upmove. If the Nifty breaks the level of 4365 then it may go all the way to test the support at previous intermittent bottom at 4092. The uptrend can continue only if the Nifty is able to close above 4693, then the Nifty targets will be 4789-4926. The indicators are showing weakness. The momentum indicators like the ROC & RSI are both moving down signaling the market is losing momentum. The MACD has already given a Sell signal. The O.I.PCR is at 1.20. Strong CALL writing is witnessed at strikes of 4600 and 4700, which will provide strong resistance moving forward. PUT writing is visible at 4500 and 4200 strikes, suggesting support at those levels. The Trendline resistance for the Nifty is at 4721 and Trendline support is at 4483-4084. For the week ahead, the Resistance is at 4653-4721-4789. Support is at 4483-4365-4155-4092. 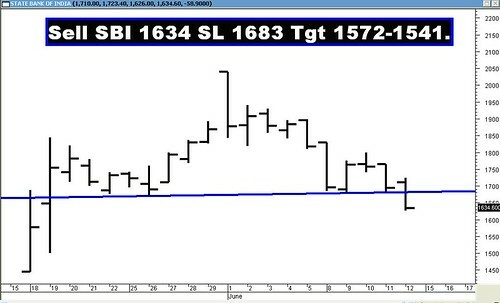 Construct a Bear Spread for SBI (1634). Buy 1620 Put at 70 and Sell 1560 Put at 45. Cost of constructing the Spread is 25 (Rs. 6600) which can be the max loss and the max profit will be 35 (Rs. 9240). SELL SBI 1634 SL 1683 TGT 1572 - 1541.